Congratulations to America. According to the US Department of Energy, Energy Information Administration, carbon dioxide (CO2) emissions were reduced 526 million tons from 2005 to 2011. This is no small amount. It is about the same as all the CO2 emissions in either Canada or the United Kingdom. Only five other nations emit more than that. The bigger news is that this was accomplished without any of the intrusive behavioral modification proposed by planners, such as by California's anti-detached housing restrictions, Plan Maryland, or the state of Washington's mandatory driving reduction program. Of course, part of the national reduction was due to the economic difficulties since 2005. However, even with 1.8 percent gross domestic product growth in 2011, EIA shows that CO2 emissions fell 2.4 percent in 2011. The magnitude of the decline over six years is impressive. 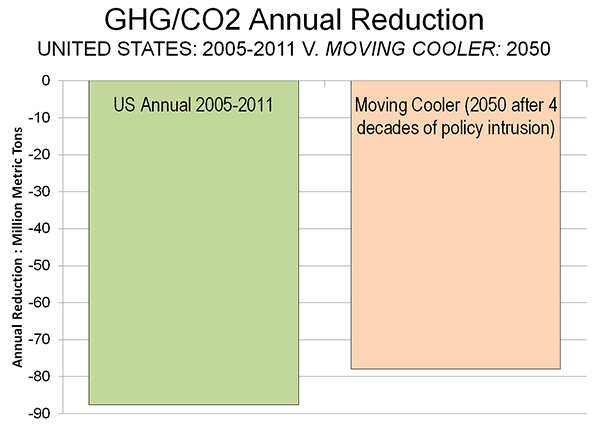 Actual GHG/CO2 emissions were reduced more annually between 2005 and 2011 than smart growth proponents claim for their strategies after 45 years of draconian policy intrusions.Modeled smart growth forecasts in Moving Cooler's middle scenario (by Cambridge Systematics and the Urban Land Institute) show the annual GHG/CO2 emission reduction in 2050, calculated from 2005, to be less than the emissions reduction in the average year between 2005 and 2011. This is despite what would be four decades of trying to force people to live where they don't want, in housing they don't prefer, while trying to drive them out of the cars that required to sustain economic growth in modern metropolitan areas. Moving Cooler's forced densification and anti-automobile strategies were so radical that the Transportation Research Board authors of Driving and the Built Environment, could not agree that a similar approach was feasible, because it would be prevented by public resistance to the personal and political intrusions (Note 1). They would also be hideously expensive, as the Moving Cooler authors ignored the much higher costs of housing associated with smart growth's behavioral strategies. In many cases, the potential socioeconomic consequences of less housing choice, crowding, and congestion may outweigh its very modest CO2 reduction benefits. Government policies have had little to do with the reductions, except to the extent that they precipitated the greatest economic downturn since the Great Depression (such as by encouraging loose lending standards and the smart growth housing policies that drove house prices up so much that the housing bust became inevitable). Market forces have made a substantial contribution to the reduction. There was a substantial shift to the use of natural gas from coal, a conversion that is really only starting. There was also a modest improvement in automobile fuel efficiency (though much more is to come). In 2007, the McKinsey Corporation and The Conference Board published a study (co-sponsored by the Environmental Defense and the Natural Resources Defense Council), which said that sufficient GHG emissions reductions (Note 2) could be achieved without driving less or living in more dense housing. Our more recent Reason Foundation report showed that the potential for GHG emission reduction from more fuel efficient cars and carbon neutral housing far outweighed any potential for reductions from smart growth's behavior modification. Note 1: Transport consultant Alan E. Pisarski evaluated Moving Cooler in an article entitled ULI Moving Cooler Report: Greenhouse Gases, Exaggerations and Misdirections. Note 2: Most of GHG emissions are CO2. Submitted by aileen123 on Sun, 05/10/2015 - 06:39. Thad Brock, a sophomore public relations and business management major from Henrietta and a Blue Matador crew leader, said there were about 634 students through this first session of RRO. Submitted by aileen123 on Wed, 05/06/2015 - 03:46. The students have been protesting since their semester fees grew five times, in accordance with a law that the university will have to self-finance its operations. The Jagannath College, founded in 1884, was upgraded to a university in 2005. Submitted by aileen123 on Tue, 05/05/2015 - 05:31. He was also asked whether leftist political parties had paid him to create public opinion in support of Jagannath University movement. Submitted by mikello85 on Wed, 05/27/2015 - 06:33. Submitted by aileen123 on Sun, 05/03/2015 - 04:18. Submitted by abel672 on Thu, 04/16/2015 - 23:47. Submitted by abel672 on Wed, 05/13/2015 - 20:24. Submitted by davidlichtenstein2 on Fri, 10/24/2014 - 04:47. The housing bust that happened back in 2006 produced some weird housing policies, but it seems that people still prefer the suburbs. According to David Lichtenstein, the CEO of The Lightstone Group, the housing market has declined, but still there is huge interest to it. Despite all the things that happened, this market is always going to come stronger and stronger. It is believed that while the population on Earth is rising, so will the price for the housing market rise accordingly. Submitted by williama on Mon, 09/01/2014 - 04:46. Submitted by sidra878 on Fri, 08/29/2014 - 09:39.